Forty-five jobs are to be lost at a north Devon dairy plant. The plant in Torrington - which processes, packages and distributes milk and clotted cream - was bought by dairy Robert Wiseman earlier this year. The Scottish company has decided to amalgamate the operation with a sister site in Okehampton. Some staff have been offered the chance to move too. The close follows a month-long consultation process. About 90 people work at the site. Glasgow-based Robert Wiseman bought the dairy, which includes the Definitely Devon brand, for £800,000 in March. 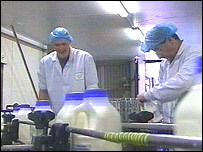 The Torrington site processes about 20m litres of milk a year. The company said that it made the decision reluctantly, but added that the plant was a very old facility and substantial levels of investment would be required if production was to be maintained in the long-term. Robert Wiseman said there were only jobs in Okehampton for 55 people, leaving about 45 unable to transfer. The company said it was most likely that the jobs lost would be in the production side, and that it was committed to giving those without a job assistance in finding alternative employment. The move is expected to happen by the beginning of December. The dairy plant site is actually owned by a co-operative of local farmers. The co-operative said it would be interested in opportunities to keep a dairy in the town, but that it was still looking how to make that happen. Robert Wiseman said the Definitely Devon brand would continue.